Oxidized Bitumen or Blown bitumen grades are produced by passing air through the penetration grades. This process gives the bitumen more rubbery properties than its original formula and they are simply harder bitumen. Hard bitumen under controlled temperature conditions is widely used as an anti-slip layer compound in the piling industry, for the manufacture of roofing felts, the roofing and waterproofing industries, for sound dampening felts and under carriage sealant in the automotive industry, electric cable joint protection, joint filling compound, sealant compound and many others. Also used in sealing saw cuts and joints where expected movements are minimum. It is also used in the manufacturing of bituminous marine mastic for the oil & gas pipeline joints. The most popular grades are; grades 95/25, 85/25, 90/40, and 115/15. We are also capable of producing other grades of Oxidized bitumen upon request by our customers. Oxidized Bitumen high softening temperatures qualify them as the excellent sealant for prevention from bleeding in high-temperature applications. Blown Grade Bitumen shall be broken up into small pieces (for the blown grade in molded cake form) and heated slowly to the application temperature of 220ºC to 230ºC. Oxidized Bitumen is predominantly used in the piling industry as an anti-slip compound for the manufacture of undercarriage sealants in the automobile industry. It is also used as a sealant compound, as a joint filling compound apart from being used in the manufacture of roofing felts and sound dampening felts. Further, Oxidized Bitumen is used in the manufacture of bituminous marine mastic, which is required for the oil and gas pipeline joints. 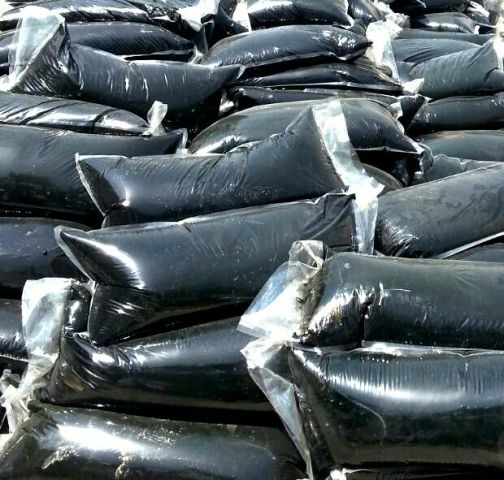 This Oxidized Bitumen is available in different grades like 95/25, 85/25, 75/25, 90/40 and 115/15. Oxidized is also capable of producing other grades of Oxidized Bitumen according to the specifications of individual clients. Some of the major advantages of Oxidized Bitumen are that it is completely water resistant, highly flexible and durable. Further, it is chemically very stable. Oxidized bitumen is a very flexible compound that is not only chemically stable but also a very durable compound apart from being completely water resistant. Lastly, Oxidized Bitumen has some very prominent technical advantages that make it a very sought after compound in various applications. The producing operation of oxidized bitumen mainly includes tank loading different steps, bitumen blowing, condenser external gasses and packing. So, in the beginning, the loose bitumen shipped to the plant by tanker is transferred to the raw material store tanker. In order to transfer the bitumen easily to the blowing tower, the burner is contrived at the bottom of the store tanker to heat them. It is necessary to say that if the blowing towers are empty, hot bitumen can be uploaded directly to them and blowing operation start. Since the volume of bitumen increases as a result of blowing and it may overflow, the blowing tower is filled up to 70 %. Air injection is usually done when the temperature of material reach to 190-230 °C. For gradual heating and also pipes filling with the air is entered from the top of the tower and at the bottom, the bitumen dispread monotonously in phase via nozzle then oxidation is done accordingly and the light molecule, volatile gasses, and steam are emitted from the top of the tower. Blowing operation is done in the temperature range 215-290°C but the suitable temperature is between 265 to 270°C. The needed heat is provided by burner contrived at the bottom of the tower. The bitumen reaction is calorific so in order to prevent the explosion danger resulted from temperature increasing, the temperature can be controlled by water injection, burner extinguisher and air amount reducing. Blowing end point is usually signified by sampling from tower and bitumen properties testing. The blowing operation stops when oxidized bitumen reaches to specified properties. After this in order to fix the final point and depolymerization bitumen got in high temperature. It is necessary to be transferred to store after packing and presented to sale. It is necessary to say that the produced gas and steam entered the condenser through the pipe fixed at the top of the blowing tower. In this stage, the bad smelling gasses and oily and volatile parts are separated from then transfer to sewage accompanied with water. Other unseparated gas parts are emitted from the top of the condenser then transfer to the furnace and burned there. After cooling the blowing oven and reaching them to 150-160°C, all the content of blowing oven which is hard bitumen is able to be loaded and packed. Because of the liquid height in blowing tower, oxidized bitumen is transferred by specific gravity and there is no need to use the pump. Packing is done in two sections and in 220-liter drum and 35 kg carton. For fast operation (preventing from cooling & hardening) in every section, several taps are fixed so that it can fill specific drum and carton with bitumen at the same time.